2 years ago when I first started blogging about Cardiff food, a new restaurant called The Potted Pig was the first place I wrote about. It turned out that I was in good company and it has since been reviewed by Jay Rayner and named in OFM Awards as Best Regional Restaurant for Wales. 2 years and 1 day later I am back, this time for the Sunday roast. 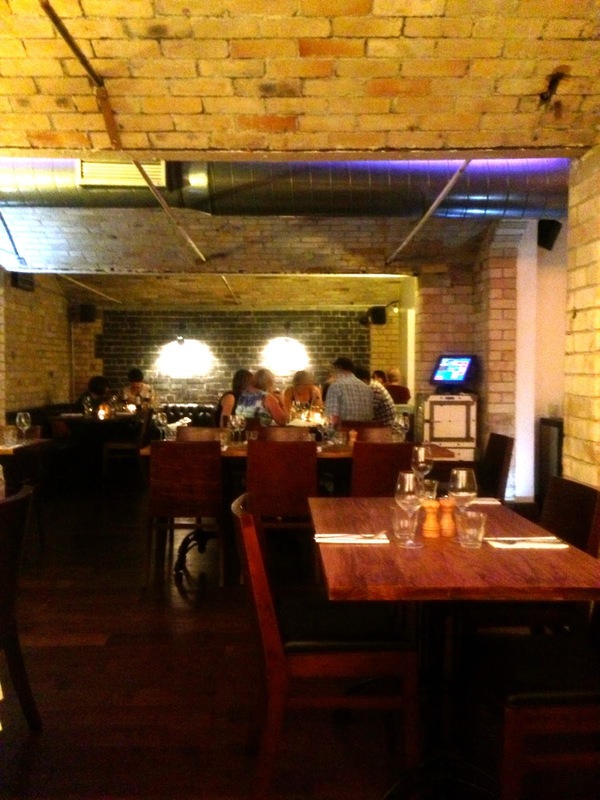 I still think the dining room lovely, set in an old bank vault, and retaining some of the original fittings, it has great atmosphere. 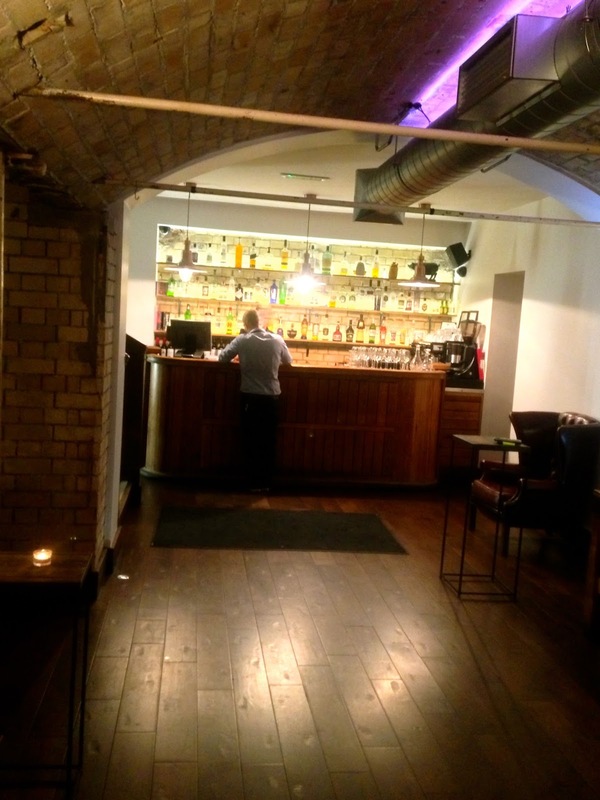 The frequently changing menu is Modern British, with occasional Italian or French touches and the encyclopaedic gin menu is also worth a mention, arranged into categories (dry, floral, fruity, spicy and so on) and paired with tonic suggestions, it is worth the visit alone. There are also a good selection of wines by the glass, although I found the Cabernet Sauvignon Villaraca disappointing. 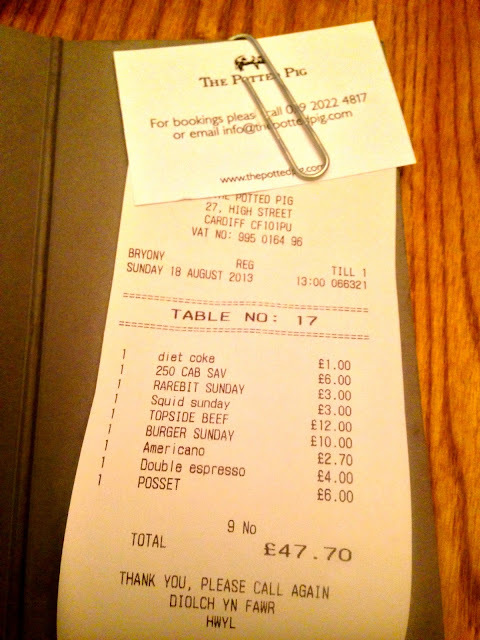 The Sunday menu is £15 for 2 courses or £20 for 3. A starter of Truffled Welsh Rarebit was decent and has been on the menu more or less consistently since opening day. The other starter of Fresh chorizo with char grilled squid & red pepper & rocket salad was a mixed bag. Excellent chorizo with sweet peppers but the squid had the rubber band twang of overcooked fish, the chunk of squid body pretty much inedible. The burger, served with cheese and crispy bacon was served well done and excellent. Straightforward and unfussy as a burger should be. 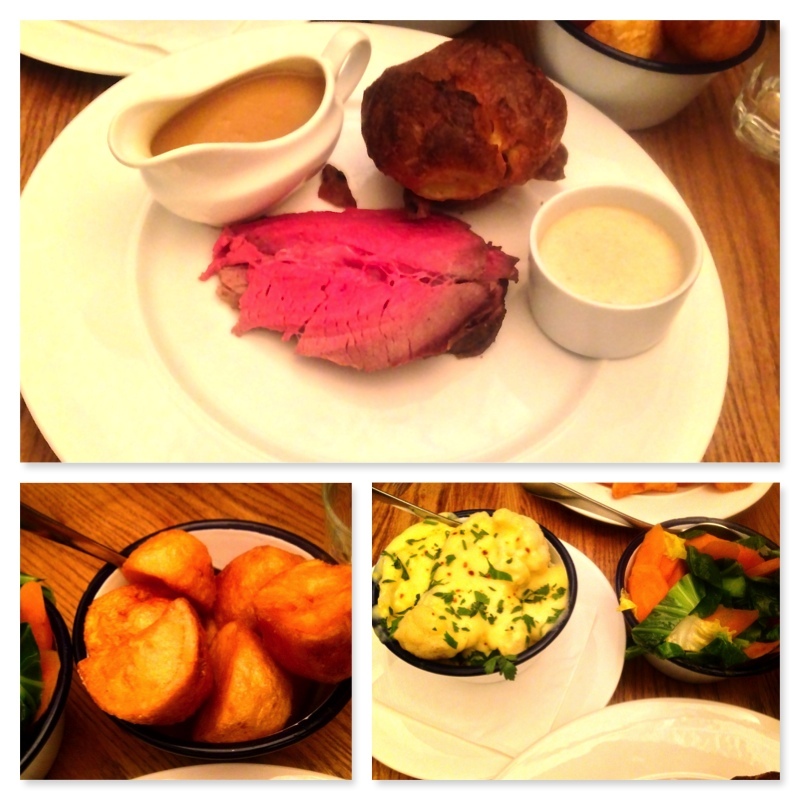 It gets better, the Welsh Topside of Beef was an absolute stunner. Thick slices of very rare beef with horseradish, marbled with fat, a crisp puffy Yorkshire pudding and a jug of properly thickened gravy (I don't appreciate 'pan juices' on a roast, I need gravy that has seen a spoonful of flour). I ended up with enough veg to feed about 4 people. The roast potatoes were beautifully crispy and tasty, I suspect they might have been finished in the same fryer as the chips. A mix of carrots and cabbage, and a bowl of cauliflower cheese that had seen a grill finished the meal. 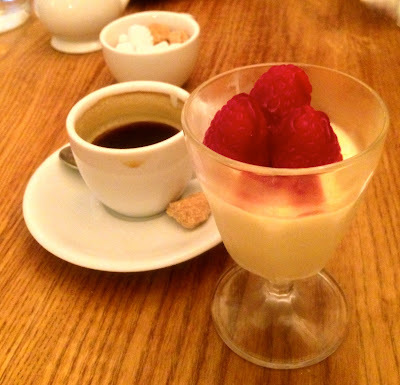 We ordered just the one dessert, a silky smooth lemon posset topped with raspberries, perfectly balanced between sweet and sharp. This is straightforward food, the presentation disguises and hides nothing, you get exactly what is described on the menu. Refreshing, and to my mind, one of the very best roasts in Cardiff. It's not for nothing that the Felin Fach Griffin was awarded Inn of the Year by The Good Pub Guide, located in Mid Wales between Brecon and Builth Wells, in a gorgeous location it has become a destination for country pub lovers and locals. Pleasingly, for a pub that takes its food seriously, there is a good amount of space retained for the bar too, we were here for Sunday lunch on a beautiful sunny weekend and keen to test drive a lunch menu that had been commended in the Observer Food Monthly Awards 2011. 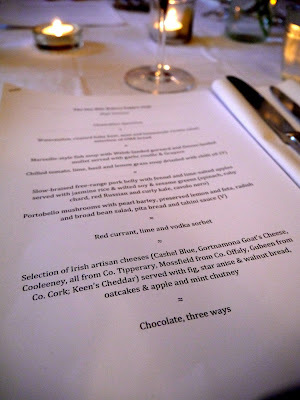 The menu reflects the setting and the pub's own kitchen garden. Each dish is described unpretentiously and still shows clear ambition in terms of flavour combinations and processes. I had no doubt that I would be well fed. A starter of Potted Oak Roast Salmon with Parsley and Brown Toast was very prettily presented, light and creamy with a metallic twang from the vibrant parsley. The brown toast was slightly impractical, so thin and brittle that it disintegrated under the slightest pressure from the pâté but provided some welcome accompanying crunch. 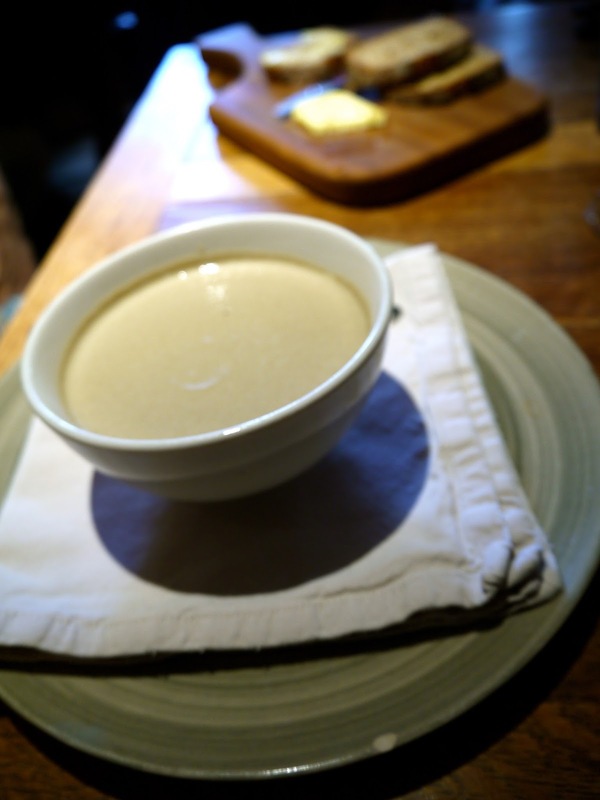 The Mushroom and Tarragon Soup was a meal in itself, thick and creamy and the tarragon stood up well to the earthy mushroom. The Roast Rib of Beef was served rare with a milder than usual, homemade horseradish sauce and accompanied by a smorgasbord of vegetables. Cabbage, carrot, broccoli, and a wedge of sweet butternut squash. If it wasn't for the fact that the roasties were crying out for some salt it would all have been spot on. The other main of Slow Cooked Pork Shoulder with Apple, Roast Beetroot, Horseradish and Lentils was excellent, small cubes of potato added texture alongside the soft pork and lentils. 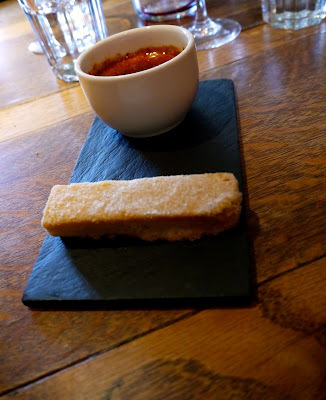 A pudding of Crème Brûlée with Shortbread was practically perfect, and the best dessert I have had in ages. Smooth creamy custard, a stunning crunchy brûlée and a very short buttery shortbread. It was such a shame that the vanilla seeds were all in the bottom of the bowl but with a dessert that good I'm finding it hard to care. Can I also draw your attention to the rather fantastic range of sherries on offer and suggest that you arrive a little early for an aperitif? I tried the No 35, La Bota de Fino Macharnudo Alto, quite dark for a fino and complex. it would be fantastic with some salted nuts or a fish starter. Last night was the inaugural One Mile Bakery Supper Club and the theme was 'summer' so in a season of record temperatures in Cardiff, naturally there was heavy rain all day and most of the evening. In preparation I Googled the term 'supper club' and was amused to discover that I would be expected to 'fraternise with other guests' but then these events are as much about socialising as food. As the guests arrived we were greeted with an aperitif and then moved into the dining room for our first look at the 5 course menu (£30pp and bring your own wine). The first course was a light summer salad of watermelon, roasted baby beetroot and homemade ricotta with nasturtium flowers, served with a selection of OMB breads. The fish course was an intense Marseille style fish soup with gurnard and mullet served with garlic rouille (a pungent garlic mayonnaise style sauce) croutons and gruyere. The meat course was soft, braised pork belly with fennel and lime salted apples, jasmine rice and a very tasty side of sesame greens. The cheese board was made up of Irish Artisan Cheeses which was served with figs and an apple and mint chutney. By this point I was threatening to unbutton something I was so full, but there was still dessert to tackle. Chocolate three ways, a verrine, an excellent tonka bean creme brûlée and frozen berries with hot white chocolate sauce. The food was all very good, the effort that had gone into the menu was evident and as always, the suppliers carefully chosen and featured a number of local producers. Most of all the evening was great fun and I met some lovely people and laughed. A lot. 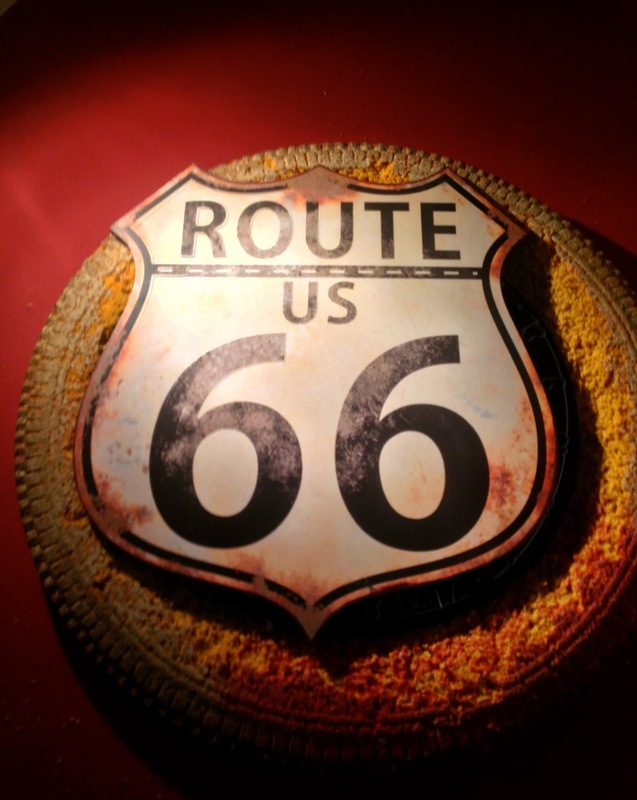 Spotted any food trends arriving in Cardiff over the last year? You would have to have your head in a bucket not to notice that 'dude food' has arrived. Make no mistake, it may look simple but this type of food is not easy to get right (just ask Jay Rayner), but here in Cardiff we have a great example of what can be achieved with the right research, knowledge and skills. The product of an extended road trip around the Southern American states, Hangfire Smokehouse specialises in real smoked American barbecue. This is a real American experience, the tables are set with wooden forks, kitchen roll and wet wipes. Believe me, you're going to need them. 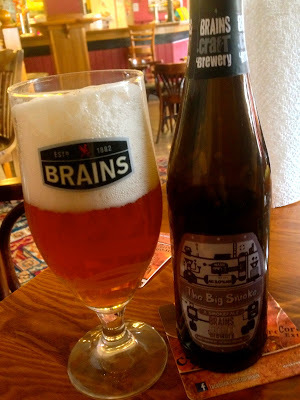 We arrived early and grabbed a Brains Craft Brewery The Big Smoke Ale. It seemed appropriate. And under advice from Shauna. "you might want to order now, it will be really busy soon", we ordered as the kitchen opened. Reassuringly there are no starters so we went straight in for the main event. The BBQ Pulled Pork Plate + 2 sides £8.50, a half pound of soft, gently spiced shredded pork was a winner. In fact, my boyfriend literally couldn't wait for me to get back from the bar before he started so there's no photo! The Hangfire Plate + 2 sides £10, a mixture of ribs, chicken wings and more pulled pork was fantastic. The ribs had a gentle hickory smoke, plenty of meat, and pulled away easily from the bone, the wings were tasty with a light covering of spice. A big plate of smoked meat - clean bones went back. The sides are also worth mentioning. 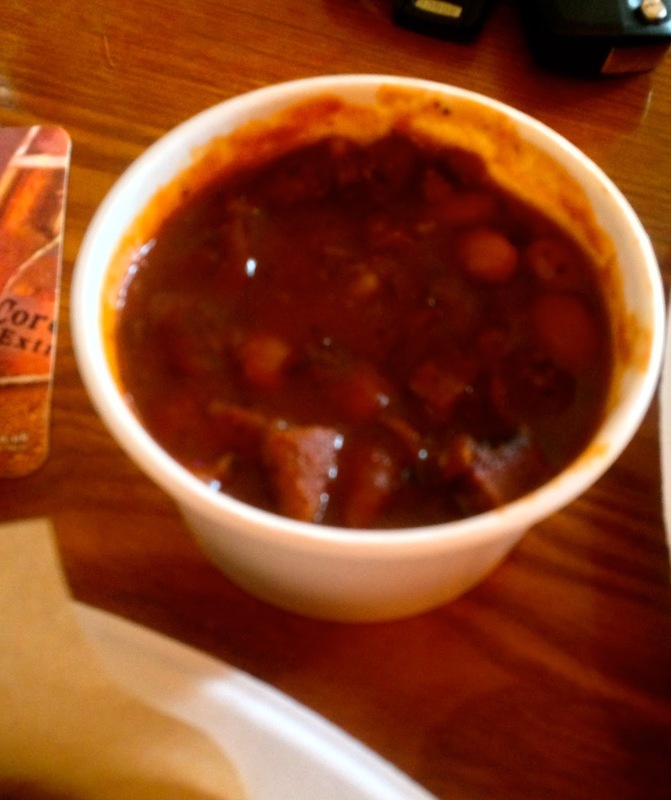 Very decent chips, sweet corn on the cob and a light coleslaw all complemented the meat well but special mention has to go to the BBQ Chili Beans with meat. Bloody brilliant they were. I couldn't tell you exactly what was in there but it tasted like smoky chipotle, garlic, paprika, and the trimmings from both brisket and pork. Pour that over the chips and you have an amazing supper. I also have to mention the homemade sauces which cut through the richness of the meats. We had three to try from, a traditional Kansas BBQ, a hot, vinegary South Carolina Mustard Sauce and my favourite, the dark, sharp, Texas Espresso BBQ. 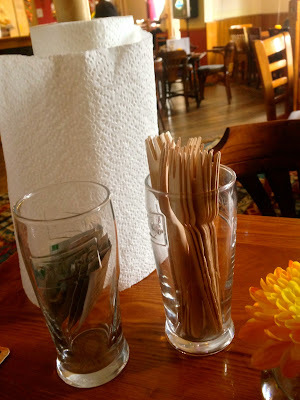 By the time we finished I'd used up half a dozen sheets of kitchen roll, 2 wet wipes and only lifted my fork to set about the coleslaw and beans. My only word of caution is that they alter their service times and locations, don't accept bookings and take orders only until they run out so aim to get there for as close to their opening time as possible!